Security is often essential even in areas that are not equipped with internet service, like in vast outdoor spaces used for agriculture, construction, or storage, or even indoor spaces like offices, warehouses, or remote vacation homes that are not currently equipped with internet networks. 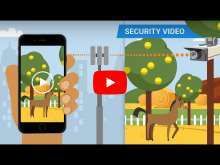 Cellular security options allow users to create a network where one does not exist, allowing for advanced surveillance options that would not otherwise be available. Cellular security may also be used in areas where a network exists but where a user wants to add additional security outside of the bounds or knowledge of network operators for added privacy. At BrickHouse Security, we provide cellular security cameras, called B-Link, that include a cellular connection and provide additional capabilities like remote monitoring and remote playback. (Features vary by device.) We offer a variety of devices and services including wireless routers and hotspots, for connecting security cameras to the cellular network. These devices are optimized for uploads, making them uniquely capable of uploading footage for streaming and playback. Some devices we carry include B-Link onboard, which means the device itself can connect to the cellular network without the added need of a router. These devices are simple to use and can connect directly to the internet, stream and download video, send notifications, and more, directly from the device. These devices come in a variety of form factors, ensuring that you have what you need for your personal or business uses. At BrickHouse Security, our security experts are always available to answer your questions and provide you with education about your security tools. We invite you to explore our learning center for more information, or contact our team directly with your questions. Security is what we do, and we are always happy to help. Remote viewing is notoriously more difficult to implement in locations where internet service is unavailable, but our cellular security systems and cameras are designed to bridge this gap. With cellular security cameras, your camera’s components include a cellular connection, allowing for remote monitoring or remote playback capabilities, depending on the individual device’s features. Cellular cameras are the ideal option for security in remote locations or areas where privacy on the network is required. At BrickHouse Security we provide a range of B-Link Secure Cellular devices and cellular home security equipment, including wireless routers and hotspots, that enable you to connect your security cameras to the internet. Where ordinary routers are optimized for downloads, B-Link Secure Cellular is optimized for uploads which makes it ideal for use with security cameras that need to continually upload footage for streaming and playback. B-Link Onboard cameras offer the benefit of built-in cellular connectivity, making it simple for users to connect to the internet, stream video, download security footage, receive notifications about events occurring around the camera, and more. Our full line of B-Link Onboard cameras, which come in a variety of form factors for countless applications, provide privacy and ease-of-use for you, whether you are using these devices for personal or business applications.